Across the first two years of each of the six presidents preceding President Trump, the Senate only had to hold 24 total cloture votes on nominations. That’s the once-rare procedural step that unlocks an up-or-down confirmation vote even though a minority has sought to block it. And in President Trump’s first two years? We had to hold a stunning 128 cloture votes to advance nominations. Our Democratic colleagues made the Senate jump over five times as many hurdles as in the equivalent periods in the Carter, Reagan, Bush, Clinton, Bush and Obama administrations combined. The Senate voted largely along party lines to change its debate rules — a move that will speed up the confirmation process for some lower-level judicial and agency nominees. 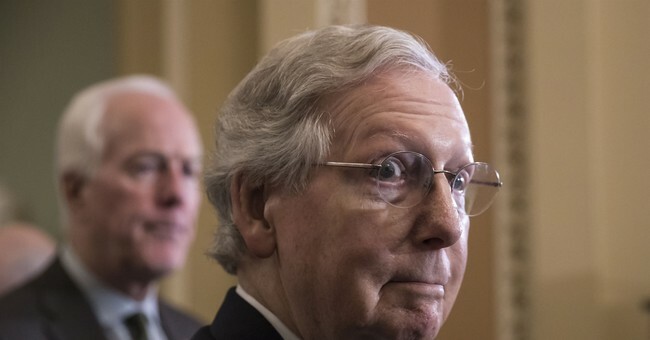 Senate Majority Leader Mitch McConnell, R-Ky., used a complex procedural maneuver, known as the nuclear option, to cut debate for lower-level nominees from 30 hours to two hours. The change does not apply to Cabinet-level nominees, federal appeals judges, members of some boards and commissions or the Supreme Court. It also does not change the 60-vote requirement to advance legislation. All Senate Democrats opposed the move, and they were joined by two Republicans — Susan Collins of Maine and Mike Lee of Utah. In response to overheated rhetoric and objections from Senate Democrats -- the large majority of whom blew up the nominations filibuster in 2013 after Republicans used Democrat-invented, Bush-era obstruction tactics against some of President Obama's nominees -- a former GOP Senate staffer with deep knowledge of these battles weighed in with a useful Twitter thread. Some of his key points, as he calls the "handwringing" from the Left "utter nonsense:"
But what about a hypothetical world in which Senators had strong problems with a truly scandalous nominee? He continues that based on the relevant history, McConnell's move amounts to a "restoration of norms:"
Durbin gives McConnell a new nickname: Nuclear Mitch. Perhaps Durbin needs a remedial history lesson, despite having had a front row seat to Dirty Bomb Harry's fateful decision -- actively supported by Durbin -- to turn the confirmation wars into 'nuclear' events. And don't even try to use the tired "Merrick Garland" rebuttal. Democrats made that bed for themselves, too.